It’s common behavior to automatically reach for the largest, juiciest looking shrimp you can find when sourcing ingredients for your next shrimp dish. However, did you know that smaller sizes of shrimp can be just as delicious? Smaller sized shrimp aren’t just the “shrimp” of shrimp. Small shrimp (less than 61-70 size) are more tender and are sweeter to the taste than their larger counterparts and can be a great main dish to be used in recipes for pasta, salads, burgers, casseroles, gumbos, jambalaya and more. They are a tasty addition to any recipe to liven up your meal. Some people even pop them in their seafood stews. You can even fry them up “Calabash” style. Any recipe calling for chicken can be easily adapted for shrimp. The possibilities are really endless! A great benefit to eating smaller-sized shrimp is that you don’t have to worry about whether you’re eating imported shrimp, which can be tainted with chemicals, hormones, pesticides, antibiotics and residue. Smaller-sized shrimp ranging from size 70-90 and larger aren’t typically marketed from outside of the United States, so when you choose the “little guys,” you can be more confident that you are eating American shrimp. Just double check the fine print to make sure that you’ve chosen wild-caught! On a large cutting board, chop the onion and mince the garlic in separate piles. Combine the vegetable broth and 11/2 cups [360 ml] water in a large liquid measuring cup, then grate the zest from one of the lemons into the cup. Squeeze the juice from both lemons into the cup. Heat a 12-in [30.5-cm] skillet over medium high heat and add the olive oil. When the oil shimmers, add the onion and sauté until it begins to soften, about 2 minutes. Stir in the garlic and cook for another minute, or until fragrant. Pour in the broth mixture and add the pasta, pressing down on the pasta to submerge it. Bring to a boil, reduce the heat to medium-low, and simmer the pasta for about 10 minutes, uncovered, stirring every now and then. It shouldn’t be completely tender yet. If the pasta isn’t submerged, add another 1/2 cup [120 ml] water. Stir in the shrimp and continue to cook, stirring, until the shrimp are almost cooked through, about 3 minutes. Stir in the spinach in batches, adding more as each previous bunch wilts, and then stir in the cheese. This will take a few minutes and the pasta and shrimp will have a chance to tenderize. There should be a little sauce in the bottom of the pan. If not, stir in another 1/4 cup [60 ml] water to juice it up. Taste and season with salt and pepper if it needs it. Heap the pasta onto heated plates and serve immediately. It’s best when really hot. Recipe courtesy of Chronicle Books. 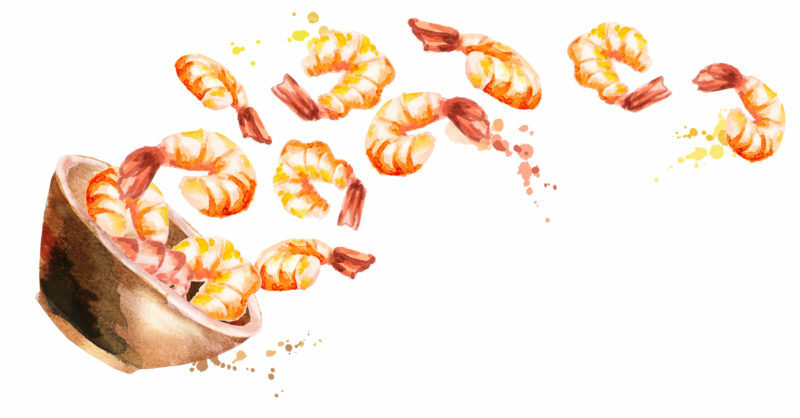 Did you know that Americans eat an average of 1 billion pounds of shrimp every year?? Shrimp are a great healthy choice for any meal, and you can never go wrong with throwing together any type of shrimp dish. In fact, they are a great source of Omega 3s, which are important to healthy aging. There’s a reason why so many shrimp are consumed every year! Shrimp can be cooked a number of ways. Try grilling, boiling, steaming or baking them for a healthy but still delicious option or use your tiny sized shrimp for delicious shrimp burgers for your next get together! Full recipe at The Seasoned Mom. Remember wild-caught, American shrimp have better taste, texture and better quality, which make them better for you and your family. Have a favorite recipe that uses smaller sized shrimp? Share it with us here or on Facebook! View more recipes using Wild American Shrimp here.